FOCUS: Lower Richland, is a unique event presented to promote South Carolina’s Lower Richland County Heritage Corridor, relative to historical preservation/conservation, tourism, and agri-education. While the event is FREE to the public, registration is requested. The 3-day event begins with a Juneteenth Reception, held at the Historic Harriet Barber House(June 19th, 6:00 pm-9:00 pm). This restored home was originally owned by ex-slaves and is now listed on the National Register of Historic Places. On Friday, June 20th – 9:00 a.m., Gems of the Lower Richland Heritage Corridor features five tour options FOCUS: Lower Richland is a unique 3-day event designed to promote the Lower Richland County, SC: Historic Sites, Congaree National Park, Equestrian Outing, Plantation & Farms, or Historic Cemeteries. The day’s culminating activity is a Farm-to-Table Feast on the grounds of the historic Wavering Place Plantation(12:30 p.m. – 3:00 p.m.), offering locally grown/raised foods. 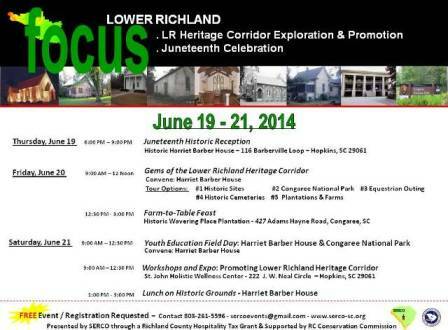 Saturday, June 21 – presents opportunities for two group activities in rural Lower Richland County (9:00 a.m. – 12 Noon). Youth Education Field Day – Youth and accompanying educators will convene at the Harriet Barber House in Hopkins, SC, and travel to the Congaree National Park for experiences on the park’s boardwalk, storytelling, and film viewing (Congaree Tales). Youth will return to the Harriet Barber House which is the setting of what was once an active farm. Activities will include a local history skit; hayrides; exploring historical inventions and a display of farming tools from the past; hands on experiences in soap making, corn grinding, potato banking, and a take-away agriculture project. Workshops & Expo, to be held at the St. John Baptist Church Wellness Center, Hopkins, SC, brings together tourists, local historians, preservation/conservation entities, and organizations for discussions on promoting the Lower Richland Heritage Corridor, and also features displays and demonstrations. At 12:30 p.m., all will convene for Lunch on Historic Grounds (Harriet Barber House). Would like to setup an Information Booth for the Affordable Healthcare Act / Obamacare Health Ins.